Turkey's main pro-Kurdish party accused the government of "spreading misinformation" about no civilian deaths in its latest Syrian offensive on Thursday, calling on Ankara to halt the operation. Deputy Prime Minister Bekir Bozdag said earlier Thursday that no civilian had been killed -- or suffered so much as "a nose bleed" -- in Turkey's air and ground campaign in the Kurdish enclave of Afrin in northern Syria. But Pervin Buldan, the newly elected co-head of the pro-Kurdish Peoples' Democratic Party (HDP), told reporters in Istanbul that many civilians had died in Afrin, including women and children. "The government is spreading misinformation by saying that there are no civilian deaths and that 'terrorists' were only killed. It is a lie," Buldan said on Thursday, adding that Turkey will "gain nothing" from the offensive. "In Turkey we have also seen the coffins of many soldiers killed. This is why the Afrin operation should stop," she added. According to the Syrian Observatory for Human Rights, 112 civilians have been killed since the operation began on January 20 -- a claim which Ankara denies, insisting the Turkish army is taking the "utmost care" to avoid civilian casualties. Ankara says the YPG is a "terrorist" offshoot of the outlawed Kurdistan Workers' Party (PKK), which is proscribed as a terror group by Turkey and its Western allies. The PKK has waged an insurgency against the Turkish state since 1984. But the YPG has been working closely with the US against the Islamic State (IS) group in Syria and makes up the bulk of the US-backed Syrian Democratic Forces (SDF), an alliance of Kurdish and Arab fighters. "The world knows that the YPG is part of the SDF which fought Daesh (IS). We believe the SDF should be part of a peace resolution in Syria," said Sezai Temelli, HDP's other co-leader. Temelli and Buldan replaced the popular Selahattin Demirtas, who has been imprisoned since 2016 over alleged links to the PKK, and Serpil Kemalbay as HDP leaders earlier this month. Ankara accuses the HDP, the third Turkish largest party and the only political group in parliament to oppose the Afrin offensive, of being a political front for the PKK, which the party denies. 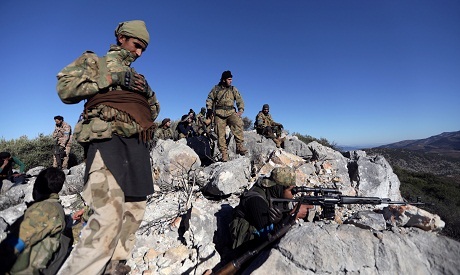 More than 200 pro-Ankara rebels and 209 YPG members have been killed since the Afrin operation began, the Syrian Observatory has said. Thirty-two Turkish military personnel have been also been killed.